This painting was done during the above mentioned demonstration given at the Allied Arts Council in Spruce Grove. 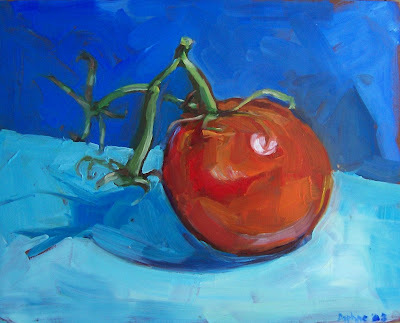 I really enjoyed painting this tomato the stems really took on a life of their own. It was great to talk to people afterwards about the painting and to get feed back. I also enjoyed hearing peoples comments while I painted. It really felt like a pat on the back. Everyone's creative energy filled the room and made me see things very clearly. Congratulations on a successful demo day! Hope you have good turnout for the workshop. If they take home half the things you have taught me, they are in for a treat!